There is no doubt that Amazon’s marketplace presents entrepreneurs and e-commerce businesses with a huge opportunity. There are entrepreneurs who are building mini-empires on the back of Amazon’s seller marketplace. But with this opportunity comes a significant risk. I’ve spoken to dozens of operators of e-commerce stores who view the Amazon opportunity with a wary eye. In their opinion, Amazon is both friend and foe. How should e-commerce business owners treat Amazon? Is it wise to shift your focus from being an e-commerce store to an Amazon seller? Or is it too risky to build your business or shift your business onto a platform, like Amazon, where the rules can change at a moments notice? For buyers, how safe are Amazon based businesses? In 2016, online retail grew by 24%. Amazon accounted for 53% of that growth in the US. Out the growth in e-commerce during 2016, Amazon was responsible for more growth than all other e-commerce businesses combined. Walmart, Best Buy, Jet, and the thousands of independent operators could not combine to outpace Amazon’s growing dominance. It might be tempting to look at this growth and wonder how a small e-commerce store could ever compete against Amazon. But hidden in this eye-popping number is a more encouraging fact for e-commerce stores: Amazon’s growth is fueled by the very businesses they are supposedly crushing. This is the opportunity entrepreneurs are jumping at. Amazon is growing at a rate like we have rarely seen in history, and they’ve invited the ‘little guy’ to join them in their gold rush. In 2015, 45% of all products sold on Amazon were from third-party sellers. And if you’ve been paying attention to what Amazon is doing, you know that they have been pushing their seller program aggressively. According to Fool.com, 2016 saw significant gains in Amazon’s seller program, with a total growth of 70%. Items shipped through their Fulfilled by Amazon (FBA) program increased by 50% during the holiday season. Outside of the US, the seller program increased by 80%. The fact is, Amazon’s growth is fueled by the growth of the entire e-commerce industry. Their growth is fueled by the growth of the industry. For Amazon, and their sellers, this is a symbiotic relationship. The sellers obviously get access to an ever increasing market share. Amazon, on the other hand, gets product expertise and requires less capital to build a massive amount of inventory. By all accounts, it’s a great marriage. We’ve Seen This Before…Haven’t We? Amazon’s growth is not the first time we’ve seen a company fuel small business growth across the world. Google presented the same opportunity to entrepreneurs in the early 2000’s. At that time, entrepreneurs built their business off the free traffic Google provided in droves (much like Amazon does today for it’s sellers). The rules of ecommerce and Internet business were determined by the rules set by Google. If Google asked website owners to have a good internal linking structure, this is how owners set up their websites. Today, the new Google — at least for product searches — is Amazon. In 2016, 55% of product searches in the US started on Amazon. Only 28% started on Google. So it shouldn’t be a surprise that business owners are placing their products where users are searching. The problem is if we do not pay attention to what happened in the past. Panda, Penguin, Hummingbird, Florida, and other major algorithm updates wiped out businesses overnight despite owners who thought they were doing everything correctly. These owners usually saw their great rankings as a huge benefit, but later found them to be the single greatest weakness. While it might seem like more and more e-commerce is being funneled through Amazon (and the numbers certainly suggest this is what is actually happening), the fastest growing e-commerce businesses are actually growing without Amazon’s help. According to the EcommerceFuel.com State of the Merchant Report, only 27% of e-commerce stores growing at a rate of 50%+ year over year have Amazon as their top sales channel. For the entire group of stores that are growing at a rate of 50% or more per year, Amazon only made up 29% of their overall sale. 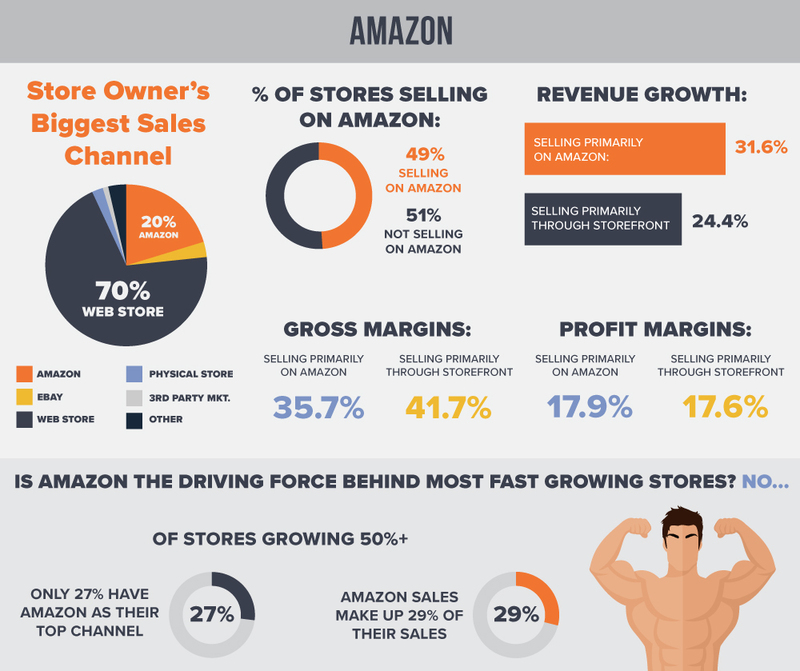 Overall, more than two-thirds of store owners are generating only 6.2% of their overall sales from Amazon. When a marketplace like Amazon dominates a segment in the way that Amazon does, it is easy to fall into the trap of forgetting about product and customer experience and focusing solely on the opportunity of the marketplace. But entrepreneurs who do this do so at the peril of riding a bubble that can pop at any time. Those that survived the Google algorithm updates were focused on building businesses around that time-tested principle of creating a unique sales proposition (USP). While they certainly took advantage of the opportunity that Google provides, they also didn’t rely on Google to be the beginning and end of their business. For Amazon sellers, whether you started with a stand-alone website or started on the Amazon marketplace, you should learn the lessons we learned from Google sellers. Great businesses thrive — and survive — because they build a unique value proposition for their customers. It is not just location or placement. As long as Amazon provides a place for e-commerce owners to place their products in their marketplace, there will be a fantastic opportunity to generate revenue. There is no reason anyone should pass this up. But we can learn a lesson from Google sellers from before the Penguin and Panda updates. Dependency on an outside company is not a formula for lasting success. Amazon is growing largely on the strength and volume of their seller program. For now, they have every reason to continue to offer a massively complex program to allow thousands of merchants to sell millions upon millions of products. From this base of sellers, they collect data, revenue, and specialization. But if the costs of maintaining their seller program, as it stands today, ever outweighs the cost of restricting the program, changing it, or eliminating it altogether (as unlikely as that might be), they will certainly make a change.